The couple posed for a series of photographs for the men's publication but Twitter users were quick to point out the striking similarity to the 1978 shoot. Another user with the handle @rachael_uriarte chimed in: 'That Forbes cover was such BS, Kylie and co literally made hundreds of millions of dollars by ripping off other people. 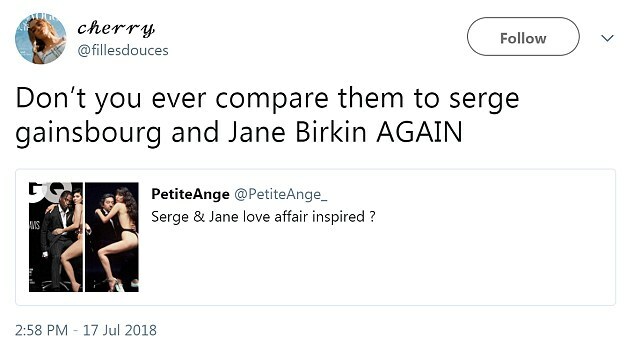 Alongside her tweet was a collage of three images from Kylie and Travis' shoot side-by-side with the almost-identical Birkin and Gainsbourg images. In one of the iconic Helmut Newton images, Birkin is seen straddling Gainsbourg while wearing a backless thong swimsuit. The 70s power couple enjoyed a 13-year romance shortly after the English actress split from English composer John Barry. Kylie's shot is almost identical a she shows off her enhanced curves in a skimpy one piece and seductively gazes at the camera as Travis sports a pinstripe suit and, like Gainsbourg, rests his left hand on Kylie's hip. The GQ piece, which was unveiled on Tuesday, noted Kylie's eagerness to be hands-on during the shoot and willingness to give her creative input. After viewing one particular image on the monitor which the photographer and stylists were praising, Kylie apparently rejected it. The Lip Kit mogul revealed it was Kim and Kanye that taught her to be more assertive on creative things. 'I just want the best cover photos for me and for you guys.' she told GQ. It's not the first time Kylie has been accused of replicating another artist's work. In 2015 the reality star posed for Interview magazine in a shoot by Steven Klein channeling iconic photographs by Allen Jones.